Australia is a long way from everywhere. You don’t realise how far it is until you’re travelling somewhere else. Smart people break their trip half way to wherever they’re going. I’m smart, but not smart enough and I’m always in a hurry to get where I’m going. A brief stop over in Abu Dhabi where I was reacquainted with the false saying, ‘Yes, but it’s a dry heat’. When it’s 43º C (110º F) hot is hot. Eventually I arrived in Rome. Not quite as hot, but hot enough. I had been studying Italian but discovered Italians don’t speak slowly and enunciate with pauses between every word like the App training voices do. I had my instructions from my travel agent on how and where to get the train from the airport to central Rome. Yes, I still use a travel agent. I’ll write about why in another post. I had already purchased my train ticket. Huge lines at the ticket counter with a human interface made me try the ticket machine. They work well, but when it’s hot and you’re the only one who doesn’t read Italian, it can be nerve wracking. But before I could get on the train I had to get out of the airport. Handsome Italian men in leather jackets wearing semi-automatic rifles with the insouciance only Italian men can muster were lounging near the exit. I had my bags. I had my train ticket. But could I leave? I had gone through a line where I told a customs officer that I was on holiday and visiting family. But no one asked if I was carrying any fruit or other edibles. I decided to approach the carefree Carabinieri, but as I approached they became less carefree. I had forgotten that Europe has been subject to terrorist style attacks for far longer than the rest of the world. They looked carefree but they were alert. They also didn’t speak English. I mimed can I go. And they waved me away. I still don’t know if I entered Italy illegally. The train in Rome couldn’t be better situated for travellers. The airport is the last stop and you get on and go. The countryside if you can call it that between the airport and the central part of the city isn’t tourist material. But I was excited. I was in Rome for the first time. I arrived at my stop and proceeded to make my way to my hotel. The App Rome to Rio advised that I could take a train, bus, Uber, taxi or walk to my hotel from the train terminus. At the end of a long flight (two flights if you’re counting and I was) I wanted the easiest way to the hotel. I opted for a taxi and the app’s estimate of total cost was pretty close to what I paid. I found the app very useful throughout my stay in Italy. Rome’s traffic is world class. Not just in numbers of vehicles and pedestrians on the road, but also in almost complete disregard for the rules of the road other than stopping on red and going on green. The route by car was much more complicated than the bus route back to the train station when I was leaving Rome. So I didn’t realise until I left that it really was very straightforward to get to and from the train station to the hotel. 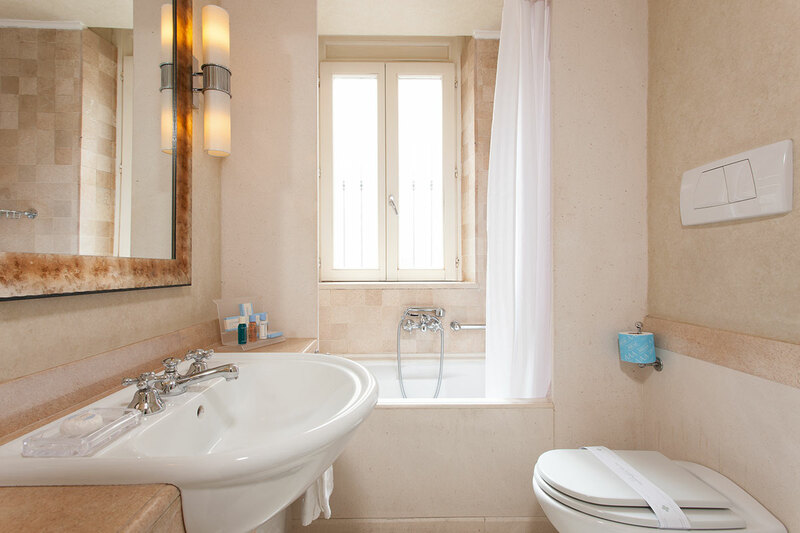 I stayed at the Hotel Stendhal a jewel of a hotel in the heart of Rome. Every hotel I stayed in had free breakfast and while everyone had warned me that this would be a dry biscuit and a cup of tea. Every hotel proved my friends wrong. Each breakfast was slightly more elaborate than the previous. They all included fresh fruit and freshly squeezed juices, eggs, bacon, multiple types of cured meats and a selection of cheeses. Fresh rolls and toast. Good quality tea and espresso to round everything off. Unfortunately for me, soy milk was not always available, but I’m a black tea girl so I forwent coffee for most of my trip. My room, a standard room, not a suite or deluxe room was very pretty, quiet and big enough for one or two people. After checking in I didn’t waste much time in the room, but went for a walk around the area. Discovered that indeed I was in the middle of the city. I had to forcibly remind myself at every corner to watch for traffic in every direction and only cross at corners (with traffic lights if at all possible). My walk didn’t last long, I was too tired and wanted to be rested for the following day, my first full day in Rome. I went back to the hotel, found out the hours for breakfast and where it would be. The breakfast area is quite pretty. It turns into a cocktail bar in the evening. Or vice versa the bar turns into the breakfast buffet station. Morning or evening the bar/buffet station is an art deco delight. It set the mood for my trip, simple elegance. I slept well and was well rested when my brother arrived the next morning to show me around. He really did walk from the train to the hotel and back again. But he had lived in Rome for a couple of years when working at the UN. After breakfast my brother and I set out to walk around Rome, locate and get a brief look at many important historical sites and buy a sim card for my phone so that I would be able to use my phone for directions, messages, backups and general phone browsing.